What if unions were software? On this day, Canada and the United States commemorate the contributions and hard-won rights of workers, which began to be recognised in the late 19th century. Noting the significance of the annual Labour Day holiday (or Labor Day, if you insist), the former President of the Canadian Labour Congress once observed, "Lots of people lost their lives in order to establish the right to refuse unsafe work and the right to be treated fairly and without discrimination." Still, today discrimination in hiring persists and equal pay for women remains elusive. But what if the role and goals of unions were to be embedded in the algorithms pervading the operations of 21st century organisations? 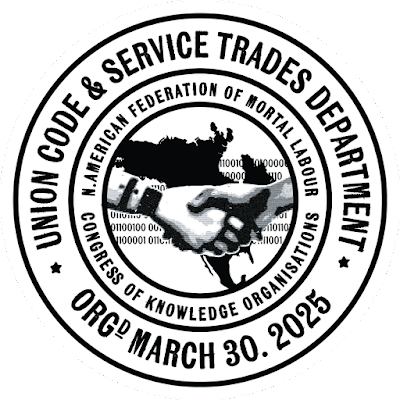 If, as Lawrence Lessig declares, "Code is law", what if unions were software? This full-page advertisement from the year 02035 appears in the current volume of MISC, "a journal of strategic insight and foresight". The issue's theme is Women. 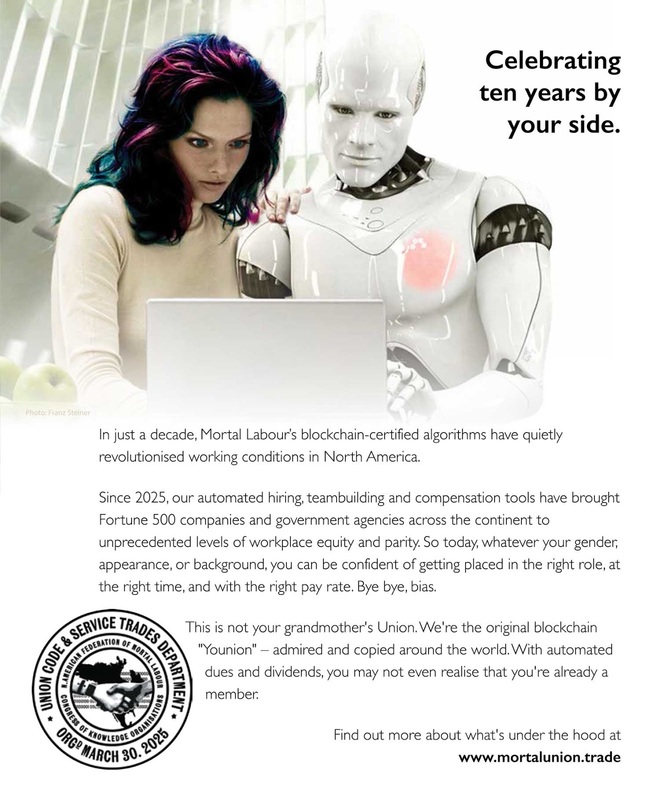 In just a decade, Mortal Labour’s blockchain-certified algorithms have quietly revolutionised working conditions in North America. Since 2025, our automated hiring, teambuilding and compensation tools have brought Fortune 500 companies and government agencies across the continent to unprecedented levels of workplace equity and parity. So today, whatever your gender, appearance, or background, you can be confident of getting placed in the right role, at the right time, and with the right pay rate. Bye bye, bias. This is not your grandmother's Union. We're the original blockchain "Younion" – admired and copied around the world. With automated dues and dividends, you may not even realise that you're already a member. This is the work of Christine McGlade, founder and creative director at Analytical Engine Interactive, and Ryan Taylor, a practising impact designer. Both are MDes candidates in Strategic Foresight and Innovation at OCAD University, and they cooked this up while taking my class in Experiential Futures last semester. In light of the trends currently unfolding in the fields of artificial intelligence, workplace culture, and social values, we hypothesize a version of the year 2035 in which gender equality in compensation, distribution of power, and recognition are realized – finally – by taking flawed human decision-making out of the equation. On this basis, we generated an office artifact from the year 2035: an advertisement for the Union of the Future. In this version of 2035, education, placement, recruitment, hiring, and team formation are all controlled by an algorithm. The “Younion” perfectly matches tasks that need doing with individuals who have demonstrated the competencies suited to doing them. Blockchain-certified, the Younion guarantees team diversity, optimum innovation, and absolute wage parity based on value and not gender. The Younion takes the bias of the bottom line. The ad does indeed start to look like a fragment of a possible, and in some ways quite upbeat, future, considering the rapid rise in workplace automation reducing availability of human jobs; the integration of algorithms into hiring processes to offset human bias; the emerging use of blockchain technology to enable independent verification of a candidate's qualifications (such as university degrees); and the potential of labour organisations to accept the challenge of developing new models for protecting workers in the face of technological disruptions. By the same token, we would be wise not to overlook the potential for these variables to net out the opposite way –– with more elaborate, technologically black-boxed bias, at least as opaque as analogue decision-making has ever been. The notion of a blockchain-enabled, bias-busting "Younion", then, is perhaps a positive vision of what law professor Frank Pasquale calls for under the banner of algorithmic accountability. 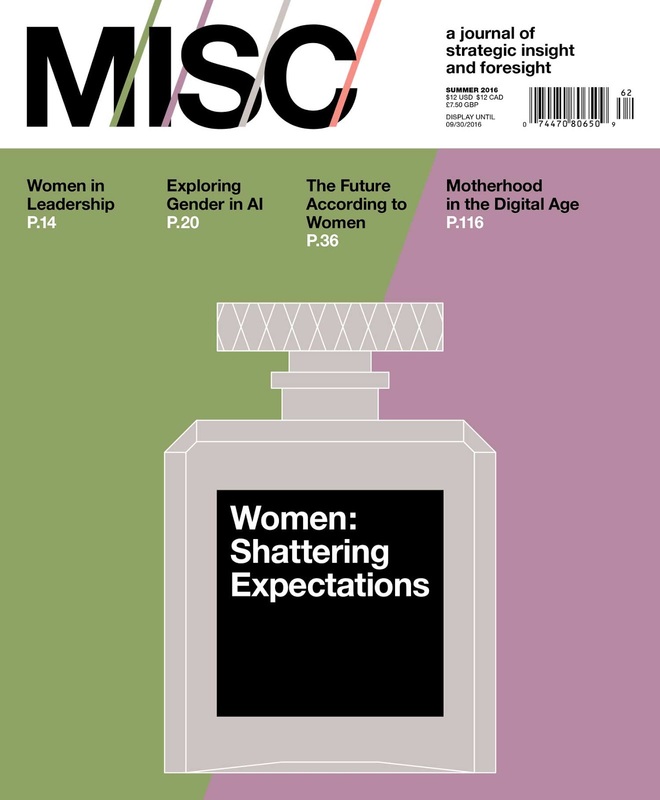 The choice of "Women" as the theme for this issue followed a widely read article in The Atlantic last year claiming a dearth of women in futures, which prompted a valuable discussion among members of the profession, and the appearance of at least two lists of female futurists practising around the world. MISC is out now on newsstands, and available to order here. A pdf of the special feature "The Future According to Women" can be found here. Special thanks to Franz Steiner of Steiner Creative for permission to use the image appearing in the ad. Much appreciation to Ashley Perez Karp and Emily Empel of Idea Couture for sharing the published material back with us. And well done to Christine and Ryan for a deft and timely piece of experiential futures work. I find it pleasing to contemplate the in-world (diegetic) advertisement as a next-generation twist on Wired's long-running and creatively inspiring feature Found: Artifacts from the Future, which sadly was consigned to the past in 02013. Diagram by Daisy Ginsberg; original here. 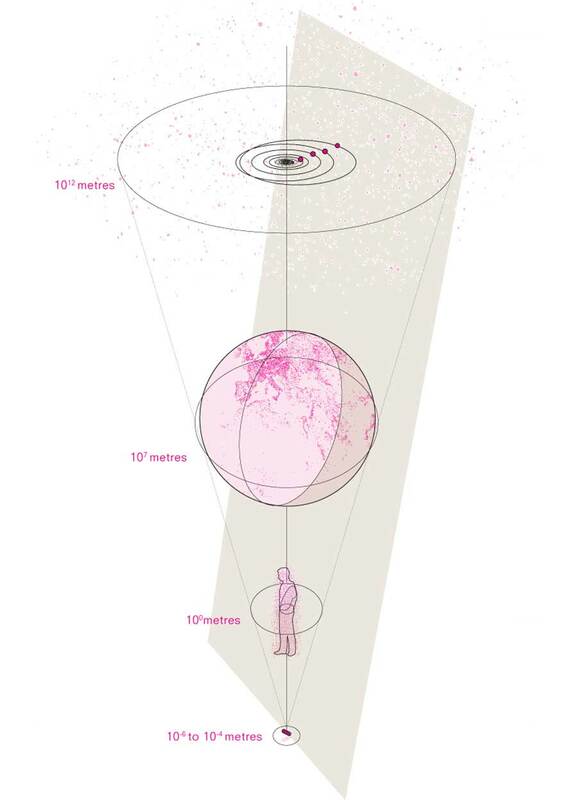 How do you scale experiential futures? If we're serious about infusing foresight into the culture at large, how can experiences of possible futures reach more people? The Futures of Everyday Life concluded by connecting the promise of experiential futures to the prospect of social foresight, a distributed cultural capacity for thinking ahead. This question of scale, then, has been a driver in much of my work over the past several years. It is in the DNA of The Thing From The Future, a game we created to make concrete futures ideation (storytelling and design fiction) faster, easier and more widespread. Itt's one of the main motivations behind the series of playful participatory design events that we -- Situation Lab and The Extrapolation Factory -- have run at OCAD [video], New York University [video] and the University of Southern California [post]. And scale is also the central question I brought to the most recent Oxford Futures Forum, held at the University of Oxford a couple of years ago now. An abstract contributed for that event is reproduced below, by way of a prelude to sharing more here soon about experiential futures practice at scale. In particular, we'll be taking a look at several dozen Time Machines created so far, as well as the Museum of the Future exhibition which I worked on for the World Government Summit held in Dubai earlier this year. In recent years a romance between foresight and design has blossomed, with much engaging and media-rich output emanating from the encounter (Antonelli 2008; Sterling 2009; Candy 2010; Haldenby 2013; Dunne and Raby 2013). Notably, hybrid practices such as "design fiction" and "experiential futures" have been entering common currency (Bleecker 2009; Raford 2012; Turney 2013). I have collaboratively developed experiential futures (a broader term, encompassing design fiction) across wildly different contexts - public art installations, client workshops, massively multiplayer online games, and so on. Hybridising scenarios and design brings visceral engagement into a dry tradition that otherwise threatens to fall short of its culture- and history-catalyzing potential (Candy 2010). Having been involved in the futures field since 1997 as (variously) a student, researcher, consultant, artist, and educator, my interest in these topics spans all these modes. The work has not always generated the expected results, but it has always been illuminating. • Antonelli, P. 2008. Design and the Elastic Mind. Museum of Modern Art, New York. • Candy, Stuart. 2010. The Futures of Everyday Life: Politics and the Design of Experiential Scenarios. Dissertation. Honolulu: University of Hawaii at Manoa Department of Political Science. • Candy, Stuart. 2013. ‘Time Machine / Reverse Archaeology: Create an experience or artifact from the future.’ In 72 Assignments: The Foundation Course in Art and Design Today. Chloe Briggs (ed.). PCA Press, Paris. • Candy, Stuart. 2014. “Dreaming Together: Public Imagination and the Future of Governance”. In Made Up: Design's Fictions. Tim Durfee and Mimi Zeiger (eds.) JRP Ringier / Art Center Graduate Press, Zurich. Forthcoming. • Candy, Stuart and Jake Dunagan. 2014. ‘The People Who Vanished: Co-creating an Experiential Scenario’. Futures. Forthcoming. • Dunne, Anthony and Fiona Raby. 2013. Speculative Everything: Design, Fiction and Social Dreaming. MIT Press, Cambridge, MA. • Haldenby, Trevor. 2013. Bringing the Future to Life: Pervasive Transmedia Scenarios and the World of Worlding. MDes Thesis. Strategic Foresight and Innovation Program, OCAD University, Toronto, ON. • Raford, Noah. 2012. ‘From Design Fiction to Experiential Futures.’ In The Future of Futures. Andrew Curry (ed.) Association of Professional Futurists, Houston, TX. This contribution can be found in the full collection of abstracts from the Oxford Futures Forum, on this occasion dealing with the theme Design and Scenarios. A recent special issue of the journal Futures guest edited by Thomas Chermack, Cynthia Selin, Rafael Ramirez and Yasser Bhatti features several articles arising from the Forum. The edited collection called Made Up referenced above is officially no longer happening, unfortunately, but the piece I wrote for it has been posted here: Dreaming Together. And the article co-authored with Jake Dunagan, listed as Forthcoming, appeared in Futures a few months ago under the title Designing an Experiential Scenario.